I pressed play on I Don’t Run just as I stepped into a nice, calm bath I’d run for myself at the end of an exhausting day. Having enjoyed the four piece’s first album and a chat with singer Carlotta last month, I’m not sure why I thought this was a good idea. It’s safe to say that relaxation and tranquility are not on the cards when HINDS provide the soundtrack. Energetic, feisty, and loaded with a punkish, no-fucks-given attitude, I Don’t Run is as loud and proud as second-album-hype can get. The clear evolution from the more inhibited and polished Leave me alone, HINDS’ new release portrays a band more confident and defiant in their own identity. I was mistaken to think I could enjoy a moment of solitude as I listened, not because the group’s trademark coarseness was in anyway irritating, but rather because I found myself enthused with the kind of energy I didn’t want: unrestrained, audacious, righteous girl power. 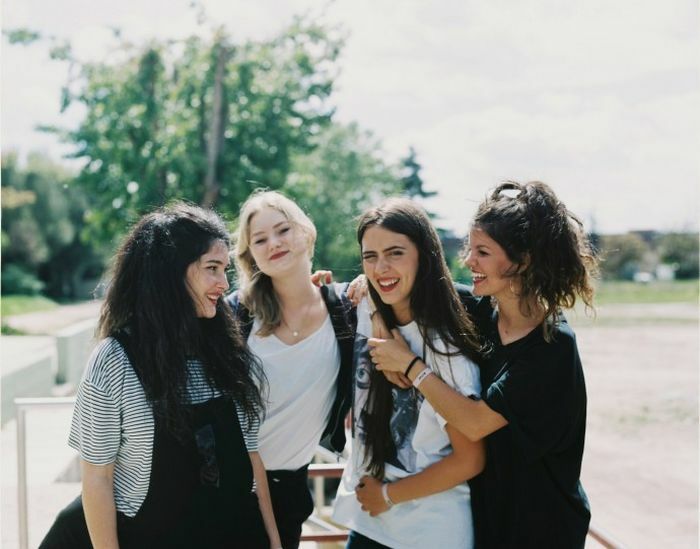 Their debut, released in 2016, was a critical success and propelled Carlotta, Amber, Ade, and Ana to the forefront of the European indie scene. The space HINDS carved out for themselves with Leave Me Alone was notable for its ‘ramshackle’ and ‘freewheeling’ character, which is a trait developed further in their latest tracks. The looping guitar riffs in ‘Soberland’, underpinned by summery hooks that echo Two Door Cinema Club vibes, are counterposed by fuzzy vocals that at times, particularly in ‘Linda’, are Cobain-esque. There is a certain kind of familiarity throughout I Don’t Run; a nostalgia kick that allows the album to sit neatly in amongst other notable new releases (The Vaccines’ Combat Sports radiates a similar energy). Angsty, rough-around-the-edges, endearingly relatable indie-pop at its prime. This doesn’t mean, as some have suggested, that HINDS are ten years too late. The women may be influenced by the big dogs of classic punk, but female-fronted rock bands are not ‘having a moment’; something tells me that the platform being dominated by HINDS and their contemporaries is of a more permanent nature. I Don’t Run is the ‘rock-chick’ answer to Dua Lipa’s ‘New Rules’. ‘New For You’, ‘Soberland’, and ‘Rookie’ provide a girl-power backbone to the album, with tracks like ‘Tester’ (the best) really screaming to be yelled full-volume down a hairbrush at post-break-up pre-drinks. When I spoke to Carlotta, she reflected on how the band’s position as ‘women in music’ was something they hadn’t thought much of or considered too important when they started out. Throughout their journey, however, HINDS have changed their tune and allowed their status as symbols of empowerment to push them further and engage on a deeper level with their audience. This development is definitely something that feels tangible when comparing Leave Me Alone with I Don’t Run.